Organization of Islamic Cooperation calls for international force “to protect” Palestinians following violent Gaza riots. A summit of Muslim leaders in Istanbul on Friday, chaired by Turkish President Recep Tayyip Erdogan, called for an international force “to protect” the Palestinians in the wake of the deaths of dozens of Gazans on the Gaza border. The final communique issued by leaders of the Organization of Islamic Cooperation (OIC), a copy of which was obtained by AFP, accused Israel of carrying out the "willful murder of at least 60 civilians" when Palestinian Arabs protested on the Gaza border Monday. It called "for the international protection of the Palestinian population including through dispatching of international protection force." It denounced the "savage crimes committed by the Israeli forces with the backing of the U.S. administration." This was the second emergency OIC meeting Erdogan has hosted in the space of half a year after the December 2017 summit, also in Istanbul, that denounced President Donald Trump's decision to recognize Jerusalem as the capital of Israel. Friday’s statement said the move to recognize Jerusalem had "further emboldened the Israeli government in its reckless behavior towards civilian Palestinian population." It strongly warned other counties not to follow the decision by the United States to move its embassy to Jerusalem from Tel Aviv. "Any state that follows... is complicit in undermining international law and order," it warns. The so-called “March of the Return” riots have been ongoing since March 30 and escalated on Monday when the United States officially opened its new embassy in Jerusalem. 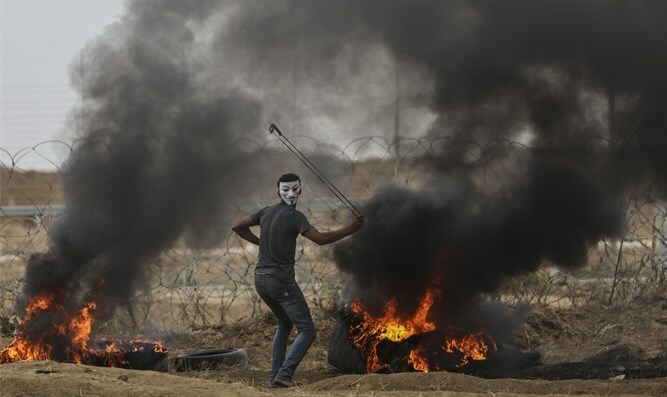 Earlier this week, one of the leaders of Hamas, which encouraged the riots, openly admitted that most of the Gazans killed by Israeli fire during border protests and clashes were members of the terrorist group. Erdogan has upped his anti-Israel rhetoric in recent days following the deaths of Gazans in the violent riots on the Israel-Gaza border. Earlier on Friday, he compared Israel's actions against Palestinian Arabs in Gaza to the Nazi persecution of the Jews in World War II. "There is no difference between the atrocity faced by the Jewish people in Europe 75 years ago and the brutality that our Gaza brothers are subjected to," said the Turkish leader. On Tuesday, Erdogan accused Prime Minister Binyamin Netanyahu of having blood on his hands.